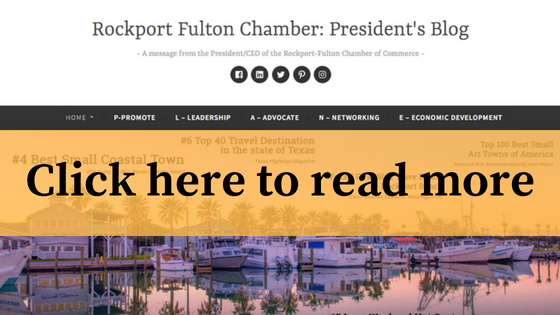 The Chamber Blog of the Rockport-Fulton Chamber of Commerce focuses on news and information on the economic activity of the Rockport-Fulton area. We serve as the voice of business for nearly 800 businesses, individuals and organizations representing a combined workforce of about 10,000 employees throughout the Aransas County area. Our mission is to work in partnership with businesses, individuals and governmental entities to promote commerce and tourism while maintaining the environment. You’ll find legislative updates, economic information to community events, this blog is a resource for those who want to stay informed of happenings of the Rockport-Fulton area.